With the upcoming Olympic Games approaching, this early promotional Barbie Gold Medal doll arrived on the market January 1975. Mattel had a two year multi-million dollar advertising campaign with the Olympics, so they were very anxious to get these dolls in the market place. A few weeks later additional Gold Medal dolls were available in other Olympic sporting events. These dolls were for sale through 1976, the year of the summer Olympic games in Montreal, Canada with opening ceremonies beginning on July 17th, 1976. Barbie is a Sunset Malibu Barbie from "1973". The U.S. dolls did not have wrist tags but #7233 Gold Medal Barbie Canada (1975) did have a wrist tag and came with a different box. Marking: Dolls #7233, #7262, #7264, #9042 and #7263 marked as follows: ©1966/ Mattel, Inc./U.S.& Foreign/ Pended/Other Pat's/ Pending/Made In/Taiwan. #7379 and #7380 are marked: © 1967 Mattel, Inc. U.S. Pat'd. U.S. Pats. Pend. Made in Korea #7261 is marked: © 1968 Mattel, Inc. Taiwan U.S. & Foreign Pat'd. Pat'd. in Canada 1967. 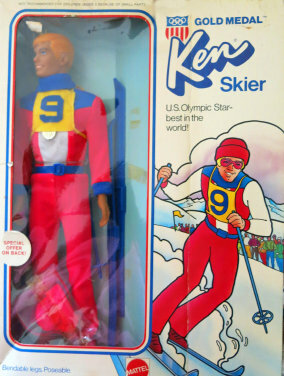 There was an arm patch & Special Gold Medal Offer that expired June 30th, 1977 that came with each doll. Mail in the coupon with $1.00 and receive U.S. Olympic Record Book, Olympic Sheild and a Olympic Medal. 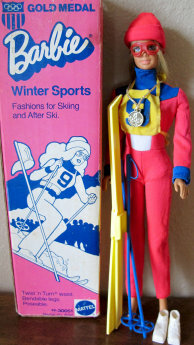 #9042 Sears Catalogue Exclusive Gold Medal Winter Sports Barbie (1975) same as #7264 Gold Medal Skier. She was only available in the catalog. She came with a change of clothes. #9044 came with the same clothes as 7233 (but a different marking). She had a total of 3 complete outfits in her set (parade dress, swim suit, and skating dress). She was the only U.S. version Gold Medal Barbie body that had the made in Korea marking. #7233 Canadian Box (75-76) She came with a wrist tag. #7379 Gold Medal Skipper doll was a promotional doll specially designed for the Olympics. She was a Malibu Skipper doll dressed in Olympic Sports attire along with a gold medal and gear. She was available only in Europe.